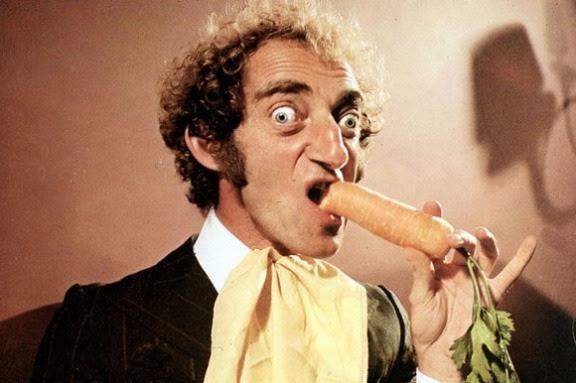 The Sunday Times: eYE Marty by Marty Feldman - The Official Marty Feldman website! How odd to publish an autobiography — and it is an autobiography, not a ghosted effort — 33 years after your death. But Marty Feldman was always jotting things down (poems, jokes, memories, aphorisms) and told his wife he was writing an autobiography. Then he died, suddenly, of a heart attack, in 1982 when he was only 48. He just had time to call his friend Graham Chapman, who was a doctor before he was a Python, and Chapman dashed to his hotel room, but he was beyond resuscitation. His wife, Lauretta, was so distraught she could never face going through his papers. But when she died in 2010 she left them to a friend, Mark Flanagan, who found this autobiography, all neatly typed and ready to go. An odd book, then, about an unforgettable and lovable man. Eric Idle says in the preface that when he went on the internet to ask who remembered Feldman, he was inundated with thousands of replies. Everyone who met him, who worked with him, loved him — he, in turn, hardly ever had a bad word to say about anyone, except perhaps British journalists, who kept asking about his eyes and why he and Lauretta never had children. He married Lauretta in 1959 and from then on she was always by his side. The great thing about Feldman, Idle says, was that he blew away the stereotype of the tragic clown: “He was a very happy clown: indeed, the clown prince. He lived a very full life doing what he loved doing, making people laugh, with the love of his life beside him.” This is a warm and engaging memorial. Click here to read the article and the first chapter of the book eYE Marty!